Poor Ramona. She has one bad leg, a terrible Texas drought to contend with, and now what appears to be a run in with some sort of pesticide. 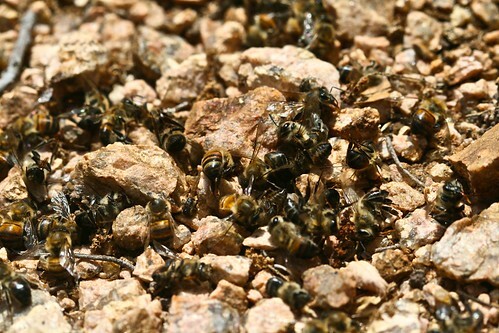 I was greeted this morning with hundreds of dead bees in front of the hive. There were also a few dead bees on the landing in front of the hive. I also noticed some bees walking around with great difficulty and were obviously affected by something. This just breaks my heart. The silver lining is that upon opening the hive, they seem to be doing ok. I didn’t see Ramona but there were plenty of eggs to be found plus several good frames of capped brood. Hopefully this is just a minor step back, and the hive will weather this storm. Oh geez. That is just heart-breaking. Are you going to get the corpses tested? In my state it’s illegal to kill a bee hive, but it can be really difficult to prove who killed them if it was a retail-grade pesticide. I hope Ramona recovers! I wasn’t planning on getting any tests done. The hive is in a friend’s backyard so I really doubt anyone did anything on purpose. The other hive is just a few feet away as well and it didn’t seem to have this problem. I think the foragers had the misfortune of being in the wrong place at the wrong time. Not sure if my post went through last time, sorry I was posting from the bus. Did you check for robbing? 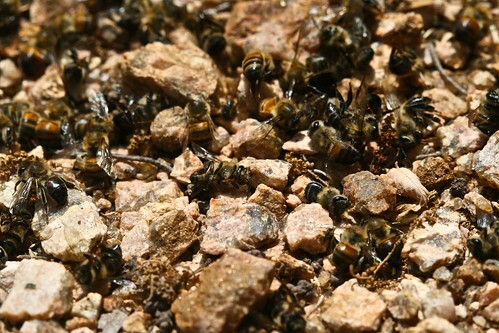 It is possible all the dead bees were caused by a large fight if your hive was being robbed. There would have also probably been tell-tale signs inside the hive such as wax cappings on the base of the hive, cappings ripped open rather than cleanly removed etc. I did check for robbing because that was my initial thought, but no tell-tale signs in the hive. Plus after observing the front entrance for about 15 minutes, there were bees landing clearly distressed and dying shortly after.